You are not logged in. 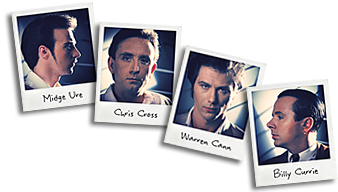 [Log In] Ultravox.org.uk » Forums » Music » Ultravox » Worryingly quiet in Camp Ultravox? #46916 - Mon, 07 Mar 2011 00:23:00 Worryingly quiet in Camp Ultravox? Gone worryingly quiet in camp ultravox? New album release date, tour dates no less?? C'mon guys, spill the beans! #46917 - Mon, 07 Mar 2011 01:05:00 Re: Worryingly quiet in Camp Ultravox? Tis but the calm before the storm, dear boy. #46918 - Mon, 07 Mar 2011 05:51:00 Re: Worryingly quiet in Camp Ultravox? #46919 - Mon, 07 Mar 2011 06:56:00 Re: Worryingly quiet in Camp Ultravox? I saw Midge live just last week and he said that he'd just got back from America and Canada where they'd been recording the new album. No other info but at least confirmation that they've been working. It'll be a while before everything's finished, packaging and publicity are ready and a tour's organised. These things take time. #46920 - Mon, 07 Mar 2011 14:16:00 Re: Worryingly quiet in Camp Ultravox? No need to stress, Rob...patience, dear boy. #46921 - Sat, 12 Mar 2011 04:21:00 Re: Worryingly quiet in Camp Ultravox? Uriah Heep and Nazareth claimed to be working on a new album about the same time as Ultravox and both have release dates set for 18th April. And the album title and track listing have also been revealed. From Ultravox we have no news or updates at all. #46922 - Sat, 12 Mar 2011 04:43:00 Re: Worryingly quiet in Camp Ultravox? Besides, you know how the band just love to string us along...and we love it, too. #46923 - Sat, 12 Mar 2011 05:12:00 Re: Worryingly quiet in Camp Ultravox? In a word ... mixing. #46924 - Sat, 12 Mar 2011 07:39:00 Re: Worryingly quiet in Camp Ultravox? If you follow Midge on Twitter, you'll know in the last day or so he's said there's no title for the album as the music comes first. Oh yes he's also reading Jo Nesbo as well. #46925 - Sun, 13 Mar 2011 04:47:00 Re: Worryingly quiet in Camp Ultravox? As we all know - all four band members and especially ULTRAVOX as a band wanted and still wants to be perfect - 10000% perfect. That is the reason while they produced timeless music and why we all love them. I think the album will be released this autumn (Sept./Oct.). Remember how long it took to release four tracks for Moments from Eden.... Besides all are involved into other procects as well. Also they need time to prepare marketing, promotion, sounds etc. etc. #46926 - Sun, 13 Mar 2011 16:52:00 Re: Worryingly quiet in Camp Ultravox? I agree. I hope they take their time and make this album really good. It will be worth the wait. #46927 - Mon, 28 Mar 2011 01:45:00 Re: Worryingly quiet in Camp Ultravox? #46928 - Fri, 01 Apr 2011 01:08:00 Re: Worryingly quiet in Camp Ultravox? #46929 - Fri, 01 Apr 2011 09:22:00 Re: Worryingly quiet in Camp Ultravox? I think they will be aiming for Sept/Oct actually. No rush.Midge is doing that awful 'Here and now' Arena thing in Summer.And doubtless will squeeze in some solo dates as and when. #46930 - Fri, 01 Apr 2011 09:35:00 Re: Worryingly quiet in Camp Ultravox? I think you're right. I did originally think Sept/Oct too, but given recent events/past releases, have been tempted to air on the side of caution - so to speak, and say at the very latest - Christmas or early 2012. Who knows hey! Like you say no rush really, we know its on the way. #46931 - Fri, 01 Apr 2011 15:49:00 Re: Worryingly quiet in Camp Ultravox? Like you say no rush really, we know its on the way. #46932 - Fri, 01 Apr 2011 17:19:00 Re: Worryingly quiet in Camp Ultravox? [qb] No rush.Midge is doing that awful 'Here and now' Arena thing in Summer. I agree some of the Here & Now tours do look dire on paper, but I've been to some that are excellent. Probably the best for me was when Paul Young headlined the night he was 'Aspelled' & Kim Wilde was the 2nd top headliner. Of course you do have to pick the act to go outside & have a beer to !! #46933 - Sat, 02 Apr 2011 07:43:00 Re: Worryingly quiet in Camp Ultravox? When I heard the news of the new album I was overjoyed and it was never far from my mind for weeks! As time goes by I have the odd wobble (Lament - not a fan) but I was inspired my Midge's confidence that the vibe is back! #46934 - Tue, 05 Apr 2011 07:40:00 Re: Worryingly quiet in Camp Ultravox? Yeah, i know but have you clocked the line-up for this one? It's like Uncle Tom Cobleys retirement do! Then we won't even mention 'Skegfest'that he is doing! #46935 - Tue, 05 Apr 2011 17:49:00 Re: Worryingly quiet in Camp Ultravox? ]Yeah, i know but have you clocked the line-up for this one? It's like Uncle Tom Cobleys retirement do! Yes I did gloss over this one!! Isn't this an outdoor one though? I've only seen Wembley Arena ones & to my mind the indoor ones do tend to have a better line up. The only 2 acts I can ever say I watched & were naff are 'Visage' (ie just Steve) & Bananarama. I did like the Narns in their heyday & still love the classics, but seeing 2 girls performing songs which clearly have a 3rd vocalist & using a backing track - nah. Of course bands like Go West & 3 Star are for me - go & have a beer bands. In fact when I did so during 3 Star's slot I met the lovely Clare Grogan who had performed not long before. #46936 - Tue, 05 Apr 2011 18:04:00 Re: Worryingly quiet in Camp Ultravox? #46937 - Tue, 05 Apr 2011 18:07:00 Re: Worryingly quiet in Camp Ultravox? No it was Jenny Logan who was told to stay away from me!! #46938 - Tue, 05 Apr 2011 18:24:00 Re: Worryingly quiet in Camp Ultravox? DISCLAIMER : Any reference to any Jenny Logan living or dead is purely coincidental. Clare Grogan on the other hand...I did once meet. #46939 - Tue, 05 Apr 2011 18:48:00 Re: Worryingly quiet in Camp Ultravox? #46940 - Tue, 05 Apr 2011 20:18:00 Re: Worryingly quiet in Camp Ultravox? #46941 - Wed, 13 Apr 2011 16:19:00 Re: Worryingly quiet in Camp Ultravox? No twitter-ing for quite a while, no mysterious vids anymore. What does it mean? #46942 - Wed, 13 Apr 2011 17:42:00 Re: Worryingly quiet in Camp Ultravox? It probably means that they are very busy indeed with finishing the album off! #46943 - Wed, 13 Apr 2011 19:16:00 Re: Worryingly quiet in Camp Ultravox? #46944 - Wed, 13 Apr 2011 19:30:00 Re: Worryingly quiet in Camp Ultravox? I think that times have changed. Back in the Good old days bands used to disappear into the the studio and nothing would be heard until the first single and the marketing campagain kicked in. Nowadays things are different- a lot acts use twitter, faceache and good old fashioned e-mail to give their fans postcards from the front. I supposed we have got used to that with other acts- I have- so its a bit of a culture shock when bands take the more traditional approach. #46945 - Wed, 13 Apr 2011 20:01:00 Re: Worryingly quiet in Camp Ultravox? I think you're right Becca. I have to say that the way many bands are embracing the technology of the web today is great - it enables them to do a fantastic PR job, promote tours, rouse interest and perhaps sell more records - looking at how DD have used it - its been much to their advantage. I think Ultravox have dabbled with web technology - in that Midge has done the odd twitter update and video but to be fair I still dont think they are really a 'customer facing' band as such and remain in the dark ages in that respect. Both Simon Le Bon and John Taylor are constantly interacting via twitter/FB and even dedicating a few mins each day to answering fans questions (slap bang in the middle of a US/South American tour), - to see that level of acknowledgement going on is quite heart warming. Obviously its not easy for every band to do that but those that do I think generally do better overall - it builds a larger sense of community and therefore loyalty. It just makes their presence stronger. #46946 - Thu, 14 Apr 2011 16:34:00 Re: Worryingly quiet in Camp Ultravox? #46947 - Thu, 14 Apr 2011 17:31:00 Re: Worryingly quiet in Camp Ultravox? I totally agree. I discovered a new artist (Heather Peace) that I like recently, and it's so refreshing to have that level of interaction on a regular basis - actual personal responses, updates, video clips - it really does engender a huge amount of loyalty. We had chatted on Twitter a bit, and when I saw her first gig in December, Heather recognised me before I even said 'hello'. I might have gone to that gig liking her music, but I came out a huge fan. I love Ultravox, but they would do well to take note. #46948 - Thu, 14 Apr 2011 17:43:00 Re: Worryingly quiet in Camp Ultravox? So, anything WE can do to make them wake up?? #46949 - Thu, 14 Apr 2011 18:38:00 Re: Worryingly quiet in Camp Ultravox? #46950 - Fri, 15 Apr 2011 00:59:00 Re: Worryingly quiet in Camp Ultravox? #46951 - Fri, 15 Apr 2011 03:20:00 Re: Worryingly quiet in Camp Ultravox? I think they are busy with the new material, probably all have prior commitments as well, and possibly even have lives to lead too! Of course I am an old fuddy duddy who doesn't visit twitter or facebook, and honestly can't see how anyone with a job and a life and a family has time to be there every day. Though I accept that is has become expected of the rich and famous. I quite like the idea of just waiting expectantly for the album to be announced....and speculating about it here a bit too of course which is the nearest I'll ever get to a cyber-life. #46952 - Fri, 15 Apr 2011 08:09:00 Re: Worryingly quiet in Camp Ultravox? MAYBE JUST A SNIPPET OF SOMETHING JUST TO WET THE APPETITE A LITTLE MORE WOULD BE GREAT. #46953 - Sun, 17 Apr 2011 07:56:00 Re: Worryingly quiet in Camp Ultravox? Nooo! That would be like being allowed to open just ONE xmas present from under the tree! You gotta wait!! #46954 - Sun, 17 Apr 2011 23:37:00 Re: Worryingly quiet in Camp Ultravox? I think the adoption of a 'traditional' approach is actually quite refreshing, especially when compared to the saturation coverage new bands give themselves via multiple layers of technology. Like Becca, I remember the old days when the only way to find out about a new release was to visit your local record store on a regular basis, check the 'U' (and 'N' and 'F') sections and hope for the best! #46955 - Mon, 18 Apr 2011 00:32:00 Re: Worryingly quiet in Camp Ultravox? I know all I need to know ie that it's coming along nicely and that the end result is going to be stonkingly good. Haven't felt any need for progress updates tbh. #46956 - Mon, 18 Apr 2011 03:51:00 Re: Worryingly quiet in Camp Ultravox? I remember the old days when the only way to find out about a new release was to visit your local record store on a regular basis, check the 'U' (and 'N' and 'F') sections and hope for the best! Not to forget the times when one of your favorite bands or artists got a positive mention or review in (at least) one of the many music magazines or if their new single was even played on the radio! What a great joy that was indeed! ... and today we have the internet and forums like this to find out about the latest news, which really isn't too bad, don't you think so? That's why we should keep it alive in a positive way now! #46957 - Fri, 22 Apr 2011 07:34:00 Re: Worryingly quiet in Camp Ultravox? I agree with your sentiments.But i think they have always been a bit like this...keeping a safe distance. Back in their hey-day,i wanted info on an almost daily basis.Nowadays and(ahem) more grown-up,i take it as it comes.When it comes. Is there a need to be this fascinated? #46958 - Wed, 27 Apr 2011 15:28:00 Re: Worryingly quiet in Camp Ultravox? I hadn't looked on Midge's Twitter updates for a few days, but I'm loving this tweet from the 19th! Still in the studio with Ultravox making what is turning out to be possibly the best work we have done collectively, ever! How strange! #46959 - Thu, 28 Apr 2011 06:20:00 Re: Worryingly quiet in Camp Ultravox?